If possible could someone please give a little advice. I am trying to get to grips with configurations and I am using the face plate shown on the above URL. As can be seen I have 8 flanges including holes, My problem is I also want to produce a face plate with 12 flanges. I have managed to configure all the required details for a 12 flange plate which work fine. However only 8 flanges appear when I choose the 12 flange configuration.Where am I going wrong? Any help would be appreciated. With the new auto-complete, you don’t need to type in # first. You can just start typing the name. Here's what I did to get it to work. I lost the holes in my process, but I think you have that part figured out. 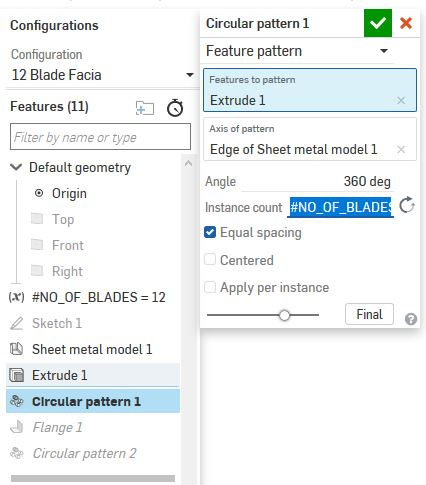 It appears you can't configure the quantity of the sketch circular pattern and it wouldn't allow me to plug in the variable so I had to make a separate feature for the cutout. Sorry for delay Cris, but how do I insert this variable into the feature list ?, been looking a while now but cant see how it is done. Need to look into variables next. Thank you , Brian. Cris not had a lot of time but been trying to copy your example but cant seem to make it work. Could you have look at the above URL to see where I may be going wrong. thankyou Brian. @brian_pinder662 You need to edit the instance count for each circular pattern with the variable name. Thanks Cris, but where do I find the hash key, don't appear to have one on my keyboard. Shift+3 is where it is generally found. If it isn't there I'm not sure what to tell you. Finally got there, thank you very much, It was the auto complete that worked as shift 3 gives me £ signe. However thanks to your patience I am now a step further up the ladder. Still a way to go but progressing slowly. All the best Brian.